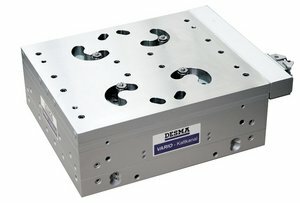 The innovative DESMA VARIO cold runner technology enables that nozzle distances are variably adjusted for the first time so that different moulds can be covered. This provides the possibility of multiple usage through easily adjusting the nozzle positions. Thus the VARIO cold runner offers major savings for the small-batch production as well. The purging of cured distributing channels is easily feasible despite most different nozzle positions. A naturally balanced distributing system ensures uniform injection irrespective of the nozzle adjustment. Despite the natural balancing, slightly different purged-out weights do always result in practice. If required, they can be optimized by available balancing inserts. Various tests in the DESMA process engineering center revealed that the nozzle position had only little influence on the quantities of material purged out. Moreover, the adjustment range (nozzle positions) can be infinitely increased to 420 mm which involves tremendous advantages.